by Satam M.A. Al Suqami, Waleed M. Alshehri, Wail M. Alshehri, Mohamed Atta, Abdulaziz Alomari, Marwan Al-Shehhi, Fayez Rashid Ahmed Hassan Al Qadi Banihammad, Ahmed Alghamdi, Hamza Alghamdi and Mohand Alshehri. "Was da geschehen ist, ist  jetzt müssen Sie alle Ihr Gehirn umstellen  das größte Kunstwerk, dass es je gegeben hat. Dass Geister in einem Akt etwas vollbringen, was wir in der Musik nicht träumen könnten, dass Leute zehn Jahre üben wie verrückt, total fanatisch für ein Konzert und dann sterben. Das ist das größte Kunstwerk, das es überhaupt gibt für den ganzen Kosmos. Stellen Sie sich das doch vor, was da passiert ist. Da sind also Leute, die sind so konzentriert auf eine Aufführung, und dann werden 5000 Leute in die Auferstehung gejagt, in einem Moment. Das könnte ich nicht. Dagegen sind wir gar nichts, als Komponisten. Stellen Sie sich vor, ich könnte jetzt ein Kunstwerk schaffen und Sie wären alle nicht nur erstaunt, sondern Sie würden auf der Stelle umfallen, Sie wären tot und würden wiedergeboren, weil es einfach zu wahnsinnig ist. Manche Künstler versuchen doch auch über die Grenze des überhaupt Denkbaren und Möglichen zu gehen, damit wir wach werden, damit wir uns für eine andere Welt öffnen." "What happened there, is  now you must all reset your brain  the greatest artwork ever. That spirits accomplish in one act something that in music we could not dream of; that people rehearse like crazy for ten years, totally fanatically for one concert and then die. That is the greatest artwork for the whole cosmos. Imagine what has happened there. People who are so completely focussed on one performance, and then 5000 people are chased into resurrection, in one moment. I would not be able to that. In comparison, we as composers are nothing. Imagine that I could now create an artwork and all of you would not only be amazed, but you would drop down on the spot, you would be dead and reborn, because it is simply too insane. That is what many artists also try to do, to go beyond the limit of what is thinkable and possible, so that we wake up, so that we open ourselves for another world." Auf die Frage eines Journalisten, ob er Kunst und Verbrechen gleichsetze, antwortete Stockhausen: "Ein Verbrechen ist es deshalb, weil die Menschen nicht einverstanden waren. Die sind nicht in das "Konzert" gekommen. Das ist klar. Und es hat ihnen niemand angekündigt, Ihr könntet dabei draufgehen. Was da geistig geschehen ist, dieser Sprung aus der Sicherheit, aus dem Selbstverständlichen, aus dem Leben, das passiert ja manchmal auch poco a poco in der Kunst. Oder sie ist nichts." When a journalist asked whether he equated art and crime, Stockhausen answered: "It is a crime because the people did not consent. They did not come to the "concert". That is clear. And nobody announced to them, you could get lost. But what happenened there spiritually, this jump out of the realm of safety, of self-evidence, of life, that also happens a little bit in art sometimes  or it is nothing." Associated Press: "Stockhausen provoziert Eklat mit Äußerungen zu USA." 18 September, 2001. "The extraordinary sight of wide-bodied Boeing airplanes speeding like bullets down Manhattan Island at near the speed of sound, a mere 500-800 feet above the busy streets, then smashing into the city’s tallest buildings, eventually reducing them to rubble—these sublime acts of terror stunned the world. In a sense, we witnessed two types of the sublime as defined by Kant, the terrifying and the splendid. The terrifying arises from the great power and speed of these projectiles carrying helpless, unknowing passengers, and the dreadful toll in lost lives; the splendid results from the magnificence of the airplanes and the remarkable, gargantuan architecture of the twin towers." "The vast, powerful, terrifying forces unleashed by ill-used human technology overwhelms our cognitive faculties, revealing to us in gut-wrenching terms our inability to grasp, comprehend, or—and this is particularly challenging for an artist—to accomplish anything of such magnitude." Journal of American Studies of Turkey # 14 (Fall 2001 ), pp. 91-96. "The planes did not fly into hospitals and schools  this was not the invasion of Iraq. The planes were out to destroy a prime symbol of Western Capitalism, with all that its Free Trade has meant to developing countries." Jeanette Winterson: Twin Towers. The Guardian, September 18, 2001. In a circular letter sent out by e-mail, the Italian playwright and Nobel laureate Dario Fo also stated his opinion on the attacks: "Big speculators joyfully splash about in an economy that lets millions of people die every year in misery. What are 20,000 dead in New York by comparison? ... Regardless of who carried out the massacre, this violence is the legitimate daughter of the culture of violence, hunger and inhumane exploitation." Julia Spinola: "Monstrous Art". Frankfurter Allgemeine Zeitung (English Language Edition), 25 September, 2001. "My friend Ruth Rendell was in conversation at the Cheltenham Literary Festival last weekend. Her sell-out audience was conservative and over-50. Someone asked a question about pure evil, citing the terrorist attacks on America as an example. With great presence, Rendell replied that we could not categorise such attacks as evil, since they were carried out from the highest motives and in the name of freedom. The audience hated this reply  there was a collective and audible shudder. Yet who reading Bin Laden's speeches can doubt it? There is no cynicism in the man  he has never heard of a spin doctor  and, unlike Jo Moore, he is not hoping to use world events to camouflage government bad news. We need not sympathise with him to recognise a gulf between the pragmatic concerns of the west and the fervent feelings of the east." Jeanette Winterson: "In a war, art is not a luxury." The Guardian, October 16, 2001. "... the ultimate event, the mother of all events, the pure event uniting within itself all the events that have never taken place." "That we dreamed of this event, that everyone without exception dreamed of it, because no one can fail to dream of the destruction of a power exercising such a hegemony  that is unacceptable for the Western moral conscience. And yet it is a fact, which can be measured by the pathetic violence of all the discourses that trie to cover it up. In the end, they did it, but we wanted it." Jean Baudrillard: "L'Esprit du Terrorisme" Le Monde, 2 November, 2001. "Terrorism is immoral. The World Trade Centre event, that symbolic challenge, is immoral, and it is a response to a globalization which is itself immoral. So, let us be immoral; and if we want to have some understanding of all this, let us go and take a little look beyond Good and Evil." 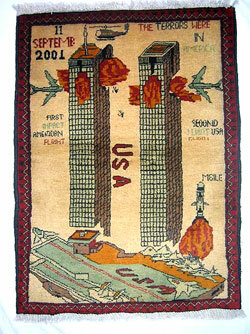 Jean Baudrillard: The Spirit of Terrorism and Requiem for the Twin Towers. Translated by Chris Turner. London: Verso, 2002, p.13. The artist Damien Hirst (...) told BBC News Online: "The thing about 9/11 is that it's kind of an artwork in its own right. It was wicked, but it was devised in this way for this kind of impact. It was devised visually." Describing the image of the hijacked planes crashing into the twin towers as "visually stunning", he added: "You've got to hand it to them on some level because they've achieved something which nobody would have ever have thought possible, especially to a country as big as America. So on one level they kind of need congratulating, which a lot of people shy away from, which is a very dangerous thing." "I think our visual language has been changed by what happened on September 11 (...) and I think as an artist you're constantly on the lookout for things like that." 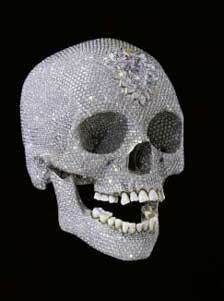 "9/11 wicked but a work of art, says Damien Hirst", The Guardian, 11 September, 2002. "We have to admit that artists presently do no longer want to make the sort of classical images which exist in everyone's consciousness such as Picasso's Guernica. In fact, since Guernica there has not been a singular artwork with a similar impact on civilization. 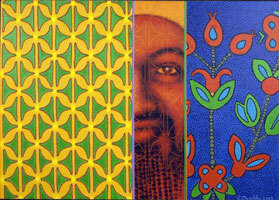 Of course, someone like Osama Bin Laden helps create those impact images today. 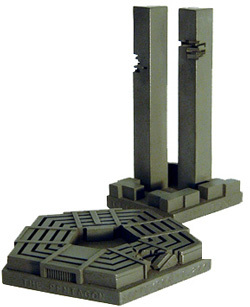 Everybody has the image of the collapsing WTC buildings in their minds. We should not even consider competing with that." Hermann Pitz: Statement presented at a Workshop at the Amsterdam Rijksacademie, 7 February, 2003. Mark Bain: Seismographic recordings of the WTC collapse transformed into sound. Presented at: )toon) 4, Nieuwe Vide, Haarlem, 23 april 2003. 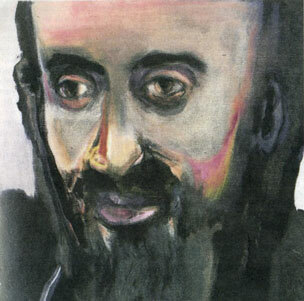 Marlene Dumas: The Pilgrim, 2006. Damien Hirst: For the Love of God, 2008. Jean Baudrillard: Requiem für die Twin Towers. Thomas van Leeuwen: Columns of Fire. Center 18, 1998, pp. 128-133. Center for Advanced Study in the Visual Arts, National Gallery of Art, Washington DC. Jonathan Smith: The Gnostic Baudrillard: A Philosophy of Terrorism Seeking Pure Appearance. International Journal of Baudrillard Studies, Volume 1, Number 2 (July 2004). Paul Virilio: Ground Zero. London: Verso, 2002. Slavoj Zizek: Welcome to the Desert of the Real! Five Essays on September 11 and Related Dates. London: Verso, 2002.